I couldn't get even a soul to believe me for even a second. Now how sorry is that?! Welcome, bytehead! Glad I'm here a little late. I'm quite gullible...thanks bytehead for saving face! You gave me a shock too. Amminichechi was too worried and even emailed me. I timed it for when I thought Anita might be waking up...Bah! And along comes bytehead and spoils my juvenile fun. Just kidding, bytehead. Please don't unsubscribe from my feeds! 100 subscribers and I can retire! Just 30 more to go. On Bloglines anyway. :-D Now, that is even more pathetic than this prank. Folks reach 1000 subscribers in a matter of weeks. And, here I am at 70. RP, I didn't want to worry anyone which is why comment moderation was not on. And I still got Ammini worried. or is that your hubby bidding adieu to the kitchen after medha pleaded with him? Pirablem yeh hai ki koi bhi Fool nahin bana. Na April Fool na sirf Phool. Medha is such a diplomat she will never say that to him. The weekend breakfast of pancakes that they make together will soon be a dream, if she does. Along with my Saturday morning sleep-in. So she'd better not say anything to him! If its any consolation, you sure had me fooled. But I sure am glad we're not losing you....I'll sorely miss your write-ups otherwise. OLO, how can I know if I have 20 or 50 subscribers? You'll probably say, "not on WordPress." And for that, you get the Purrfect Phool I ever grew, Nabeela! Anita, my dear, you have 19 subscribers on Bloglines. Me, being one of them. But this count is only for those who have subscribed using Bloglines. Sage and Google Reader don't show you how many other subscribers there are for a feed - or if they do, I haven't found it yet. Feedburner does. The number of subscribers is not dependent on the CMS you use to publish your blog. It depends on the reader used to read your feeds. The number of subscribers is a vanity thing with the high profile bloggers. No phool for you, Nandita. But I think the Monday morning laugh more than made up ;-) Please use Bloglines nahin to counter upar nahin jayega. I am reaching the limit of my Bombaiyya Hindi here! Any further murder of the language is to please be ignored. Or at least laugh softly and turn your face away from the monitor so my poor blog is not subject to more embarassment because of me! Manisha a lovely phool (flower) for you for trying to make fools of us. Heheh! So all the others, now how many were they at last count, have other feed readers. You cannot murder Bumbayya Hindi, itself the celebration of murdering Hindi! So, you go ahead bindaas! Meeta, I didn't get a flower. But I'll settle for some of that Roquefort Walnut Savory Loaf. Droool! Bindaas, you say? With your blessings, then! Shock! and laughter and more!! but i believed it for a minute because this post wasn't there till noon PST! Madam, main to April fool ban gayi!! Waise is phool ko fool banane ki zyada zarurat nahin-hum ready-made hain ;). Manisha, you had me going until I clicked on comments to see what was going on....brat! brat! brat! Medha will be your mother by the time she's 20!!! I'm an easy fool! I felt my heart plummet down past my boots when I read your post, Manisha. Manisha and RP: I was worried, but I did ask you both if this was an April fool's prank. Manisha: I was more concerned about you not posting on certain forum threads. We can't afford to miss you there. Don't worry Manisha. I fell for it :(. I was too shocked. I thought of reading the comments first..and then there u are....I am happy that I would still be reading sweetie pie Medha's adventures here. That is one of my favorites apart from your gorgeous recipes :). Manisha, if it is any consolation, you had me fooled for a second till I came to the comments page! Darn it! I can't believe I missed this. I wish I had seen this before bytehead, I would loved to stir things up a bit. (Sigh) well, there is always next year. always late to the party, darnit! lol lol Good one Manisha! I fell for it. You know I am new so I don't know the evil side of this blogger:)):)). wish i had read it yesterday. 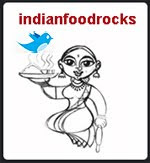 I have been looking for some sites/blogs regarding indian food and reached here. Found this blog to be quite interesting. You are right "Indian Food, really it rocks." hai manish sorry for the inconvenience. Palani/tpraja, apology accepted. Best of luck!